Let’s bring the Bob Dylan – Sam Shepard relationship to a close. In July 1987 Shepard published an “interview” with Dylan in Esquire under the title “True Dylan”. Written in the form of a one-act play, the piece was later anthologized as “Short Life of Trouble” in Shepard’s 2012 book Fifteen One-Act Plays. I’m not sure what Esquire might have made of this interview, so let’s credit them for the fact that they even ran it. The play opens with a character named “Sam” visiting the home of a musician named “Bob”, with a tape recorder and a six-pack of beer. Bob spends a good portion of the play on the phone trying to get the area code for Tulsa, and trying to decide if he is going to attend some unspecified party or event. When Bob is on the phone Sam plays back the recording of their conversation, only to find it gone – replaced by the piano music of Jimmy Yancey. There are two car accidents during the play, though neither of them is noticed by either of the characters. They talk of polka music, James Dean, and angels. To me, this is the best interview with Dylan that I’ve yet read. As I’ve noted now twice, Shepard seems to get Dylan in a way that others don’t – or at least his myth-making of Dylan matches closely with my own. We don’t learn much about Dylan here that we don’t already know about his relationship to Woody Guthrie, or his taste in music (Hank Williams, of course! ), but Shepard has an incredible ear for dialogue, for phrasing, for the pauses that seem to characterize Dylan’s way of speaking and thinking. It seems to me that Shepard captures this exceptionally well. That’s the best thing I’ve read about Dylan’s transformation in the late-1960s, and it is a beautiful evocative piece. I’m not certain that Dylan said it – Bob clearly tells Sam that he’s free to make up anything that he wants in the play – but I hope that he did. I can’t access an actual copy of the Esquire piece, so I don’t know how it was illustrated. 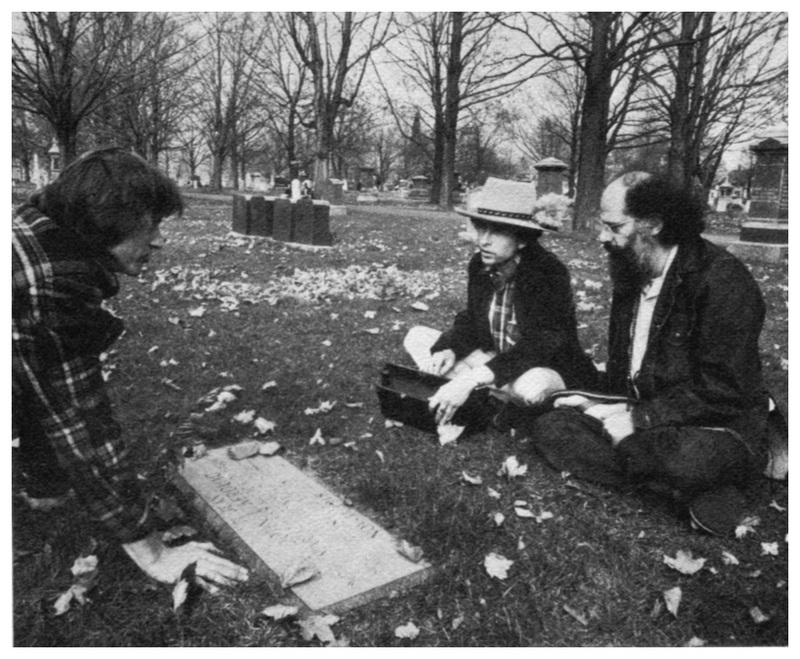 That photo above is from 1975 – Dylan, Shepard and Allen Ginsberg at Jack Kerouac’s grave. Bob Dylan’s 1986 album, Knocked Out Loaded, would be a surefire pick for his worst album ever were it not for one bizarre fact: it includes what may actually be the best song that he ever wrote. I know that is an extreme suggestion given the unbelievable heights that he scaled in the 1960s and 1970s, but “Brownsville Girl” is an exceptional song. Let’s see if we can build this case. I was in Denver a couple of weekends ago, having drinks with my friend Charles (who has thrown a lot of remarks into the comments section of this blog over the past six months). Charles mentioned to me that he’d recently heard this song, “this eleven-minute epic about a Gregory Peck movie”, that was the most surreally bizarre thing that he’d ever heard. Did I know it? Yes. Absolutely. I remember the first time that I heard this song. I’d been disappointed by Knocked Out Loaded for a few days, and had played the first side a few times but not the second. I’m not sure why I didn’t flip it over. Finally I played “Brownsville Girl” for the first time and it literally blew me away. Here was the most improbable gem ever. Every single element of “the bad 1980s Dylan” could be found on this song – the horns, the back-up singers – but it just all seemed to work. It was this miraculous thing where Dylan keeps producing songs and wrecking them for years with all this unnecessary extra stuff, and then, suddenly, everything just falls into place. It’s as if all the disastrous mixes of the past few albums were just preparation for this incredible epic thing. The most Dylan song of all Dylan songs. My wife reminds me that I played this for her on one of our first dates. I’m not sure why. I wasn’t that much of a Dylan fan at that point, but it seems that I was still a fan of this song. It is one of her favourites as well, and I’m sure that’s part of why we’re still together after twenty years – I can’t imagine that I could be with someone who wasn’t fascinated by this song. I’ve played “Brownsville Girl” for dozens of people over the years. Many quit on it. They get bored. It’s too long. They don’t engage with the story. Those are people that I don’t play music for any longer. I’m really only interested in the people who hear this and who lean into it wondering “what in the world can this song possibly be about?”. I’m still wondering. I can’t get WordPress to embed the song because it’s not hosted on a site that they like. Click through to a new window to listen to this song if you’ve never heard it. 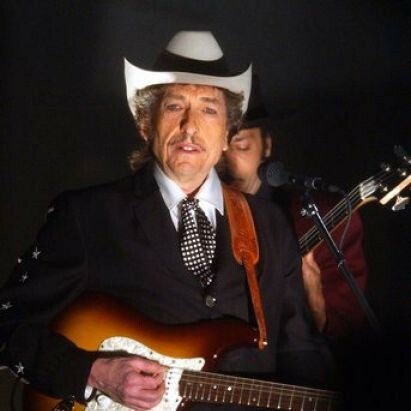 “Brownsville Girl” is one of Dylan’s co-authored songs, something that he hadn’t done much of in a decade since collaborating with Jacques Levy on much of Desire. This one is co-written with the great American playwright Sam Shepard. It is seamless. Read Shepard. Listen to Dylan. Play “Brownsville Girl” and tell me that one line or another is definitely the work of one of these men. It’s impossible to do so, the integration of their points-of-view is complete. Reading this I was struck by how consistent the mental images are that I have for some Dylan songs. In “Hattie Carroll”, to use on of Shepard’s examples, I always see that ashtray in a dimly lit bar in an open space on the second floor of a hotel, with stairs going down that run parallel to the bar. I see the initial action in “Hurricane” from a bird’s eye point-of-view, from a walkway that circumnavigates the bar like the saloon in a western. I don’t know about you – but I always see it the exact same way, no matter what Dylan does the song musically. I’d never noticed that before. Shepard, of course, is exactly correct. Dylan is an incredibly imagistic songwriter. “Brownsville Girl” is one of the most imagistic of all of his songs. For me, this song is an “instant film”, to use Shepard’s term. It’s a Ridley Scott film. It’s Thelma and Louise, but with Dylan as the male lead. Take these lines, for example. The whole song is this way. It may be the most visual thing that Dylan has ever written because it is so incredibly mythic. The quick shifts from iconic images (“rolling up in a trail of dust”) to the incredibly specific (“a pompadour”) allow us to build the images quickly. To tell the story. Bob Dylan isn’t simply an imagistic writer, though. 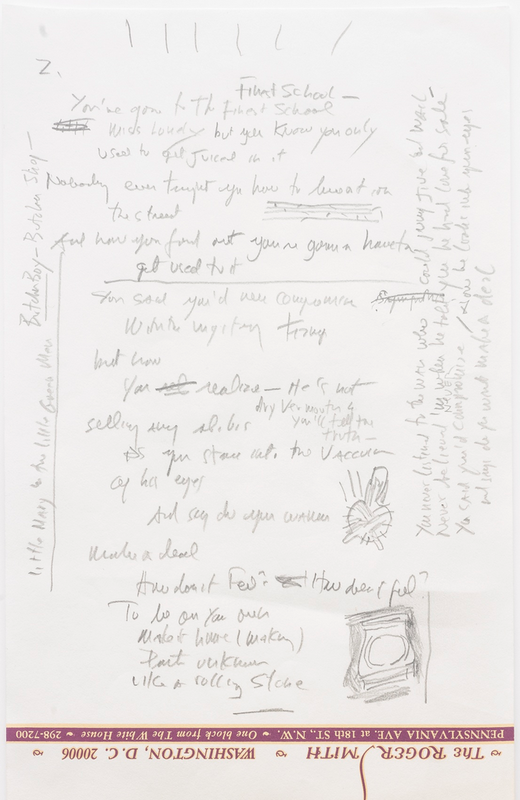 He has a habit of writing some of the most aphoristic lines in the history of popular music. If you wanted to get a Dylan line tattooed on yourself, this song gives you the most choices. It’s Dylan’s Hamlet, an incredibly rich source of quotable lines. For instance, the most fatalistic line in any rock song ever has to be: “Even the swap meets around here are getting pretty corrupt”. What an incredible verse that is. Both the first and third lines are exceptional statements of a Dylanesque philosophy. Indeed, Dylan made on-stage remarks akin to the convenience line while on tour in 1986 – you can tell that he was working this through. When I was in high school the two writers that I was most interested in were Bob Dylan and e. e. cummings. I filled the end papers of my calculus book with Dylan quotes and my trig textbook with quotes by cummings (“they did not stop to think they died instead”). I was a pretentious kid, obviously. Yet all these years later I still recognize the beauty of some of these phrases. If I had a textbook, I’d write them into it. I was going to write that this is the best Dylan story song, but I’m not one hundred per cent convinced that it actually tells a story. It is an epic, sure, but the story is fleeting and fragmentary. The song has seventeen verses, and the chorus is sung four times. The first section includes six verses before the chorus (indeed, on first listening, you sort of assume that there will be no chorus). The second and third sections include four verses each. The final section is only three. The chorus, with all of its amazing power coming from the Queens of Rhythm, accelerates in frequency and velocity as the song goes along. The memory of the Brownsville girl, to whom the song is sung, increases in ferocity every time – it cannot be held back. The performance by Dylan’s back-up here is incredible. Intense. Moving. The three-part howl that they let out is blood-curdling. It gets me every time. On no other song does he use his support even half as well. They are a Greek chorus here, even dropping in their own commentary on the action (“Oh yeah?”). 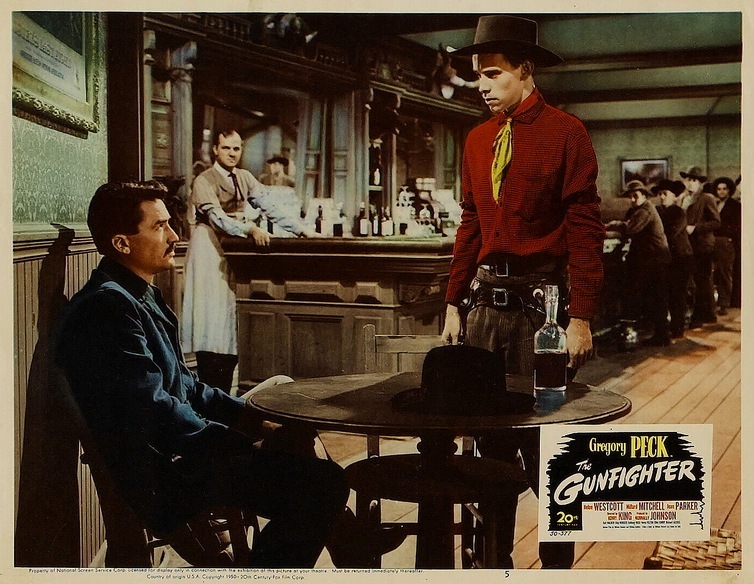 Of the seventeen verses, six of them are about Gregory Peck and, specifically, his 1950 western The Gunfighter. The plot of the film is detailed exactly in the first three verses, particularly the conclusion in which gunfighter Jimmy Ringo is shot down by the cowardly Hunt Bromley. The Gunfighter isn’t a great western – it is really only passable – but Shepard and Dylan make it positively mythic. Not only is the conclusion – in which Ringo insists that the town let Bromley go so that he too can meet his doom at the hands of “hungry kid trying to make a name for himself” – completely grandiose, but the narrator repeatedly sells the memory of the film (“I keep seeing this stuff and it just comes a-rolling in / And you know it blows right through me like a ball and chain”). The segue from the film is directly to the Brownsville girl (“You know I can’t believe we’ve lived so long and are still so far apart / The memory of you keeps callin’ after me like a rollin’ train”) and the relationship itself is established as akin to the Peck film – a betrayal on a grand scale. As for the plot, what is there is clear but sketchy. It’s an easier thing to piece together than “Tangled Up in Blue”, but the details are not always set. The couple meet in the painted desert. The travel to San Antonio and sleep at the Alamo. In Mexico, something happens that requires a doctor, and she disappears while he is trapped as a wanted man. In the second section, the narrator travels with his new girlfriend to the home of Henry Porter, whom they never meet. They talk to Ruby. In the third section the narrator is arrested for a crime that he didn’t commit (“I didn’t know whether to duck or to run, so I ran” – what an incredible line). His ex sees his picture in the Corpus Christi Tribune and she perjures herself to save him from prison. The narrator stands in line to see a movie starring Gregory Peck. That’s it. That’s the story. It’s not even entirely clear where the second section fits. I say he travels with his new girl, but it’s not exactly certain that that is true. Who is Henry Porter? We never learn (“The only thing we knew for sure about Henry Porter is that his name wasn’t Henry Porter” – one of the best lines ever). Who is Ruby? We don’t know. Who is the Brownsville girl? After eleven minutes, we really don’t have much of an idea. I’m sure my Brownsville girl isn’t the same as yours anyway. That title, of course, refers to the Woody Guthrie song, “Danville Girl”. Shepard and Dylan borrow a fair bit from Guthrie here – specifically the curl/pearl rhyme – and the disappearance. Nothing in “Brownsville Girl” suggests that the woman is “high tone”, but imagining it does lend the song a certain nuance. “New Danville Girl” isn’t as good as “Brownsville Girl”. It’s more stripped down. There are back-up singers, yes, but they’re not fierce and vocal and active. They don’t talk back. Dylan’t singing isn’t as strong, and the things that usually ruin a Dylan song – like the horns – are missed. You can learn a lot about Dylan’s revisions from listening to the two versions back to back. Only two of the seventeen verses are exactly the same in the two versions, although a handful of them have only minor changes. I would argue that there isn’t a single verse in “New Danville Girl” that is superior to “Brownsville Girl” though, every single alteration is an improvement, some of them massive. “Brownsville Girl” opens with a perfect phrase: “Well, there was this movie I seen one time”, where “New Danville Girl” stumbles out of the gate: “I wish I could remember that movie just a little bit better”. One is mythic, the other is faulting. This version is terrible – it lacks all of the poetry, and I have no idea what is meant by a place that starts to feel like Mars. I’m not sure Dylan and Shepard do either. Even very minor changes make enormously huge differences. In “New Danville Girl” the location of Ruby is changed: “We could see Ruby in the window as we came rolling up in a trail of dust”. The mental image that is painted isn’t half as compelling as the woman hanging laundry. Other shifts in phrasing carry a lot of weight. For instance, the difference between “It was the best acting I saw anybody do” and “It was the best acting I ever saw you do” fills a vast expanse. That’s not nearly as good a verse, but the one line (“Nothing happens on purpose”) has a real mystical charm to it. Awful. 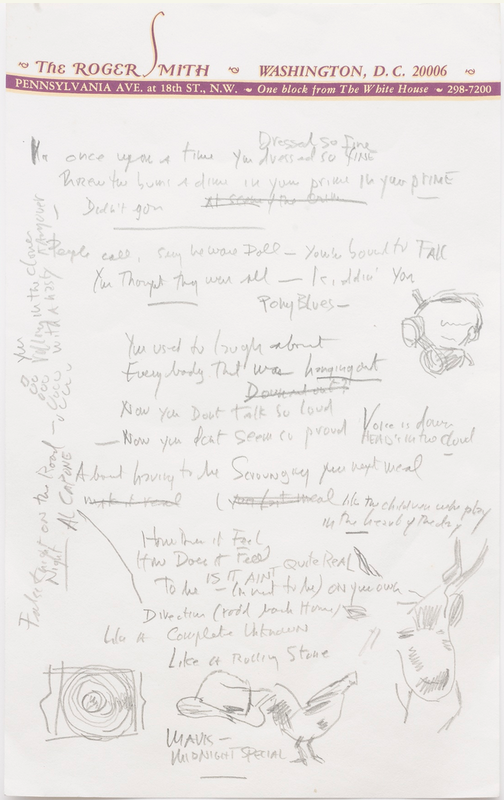 Funnily, though, the phrase “you got it made in the shade” appears in the original hand-written lyrics for “Like a Rolling Stone”. It seems Dylan has been trying to use that line for two decades. Of course, he rhymes “made” and “shade” in “Tombstone Blues”. Isn’t that just the saddest thing ever? I almost cried. He omits not just a verse or two, but ALL SEVENTEEN VERSES! It’s just the chorus, chanted over and over. Heartbreaking. Recently my sister-in-law forwarded me an article from the Telegraph. It is a provocative piece that argues that based on only his 1980s output Bob Dylan would still be one of the greatest singer-songwriters ever. A gutsy argument, and one that I can find some sympathy for. 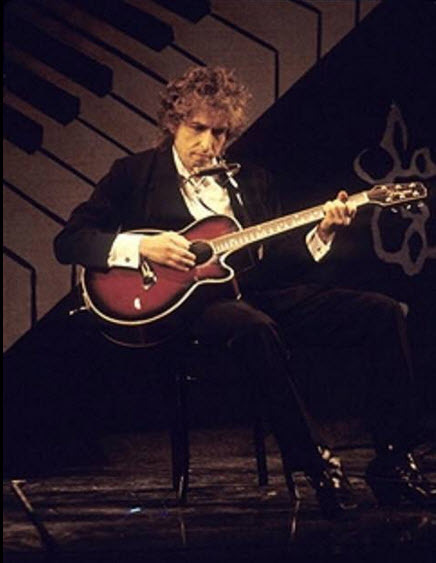 The writer, Neil McCormick, picks the ten best Dylan songs from the decade: “Every Grain of Sand”, “Dark Eyes”, “Series of Dreams”. No arguments from me. But he omits “Brownsville Girl”. It is astonishing. I feel like it invalidates everything else that he writes in the article. For me, “Brownsville Girl” has everything that I love about Dylan all in one song, and even the things that I don’t love about Dylan I love when they’re in this song. It shouldn’t work. It’s an eleven minute epic about lost love and Gregor Peck. With horns. And yet, I think it sums up every single thing that I care about when I care about Dylan, from the Guthrie references, to the vivid imagery, to the vaguely potent philosophical sentiments. His vocal performance is powerful and grows stronger with every minute. The best Bob Dylan song ever? Could be. The first Bob Dylan concert for which I bought tickets was not the first Bob Dylan show that I ever saw. Instead of seeing Dylan, Tom Petty and the Grateful Dead I had my ticket confiscated by the police, and, eventually, got beaten up over it. Ahh, high school. On July 4, 1986 Bob Dylan played a big show at Rich Stadium in Buffalo, NY. This was one of the four large stadium shows that he did that month backed by Tom Petty and the Heartbreakers, and with The Grateful Dead opening the show. 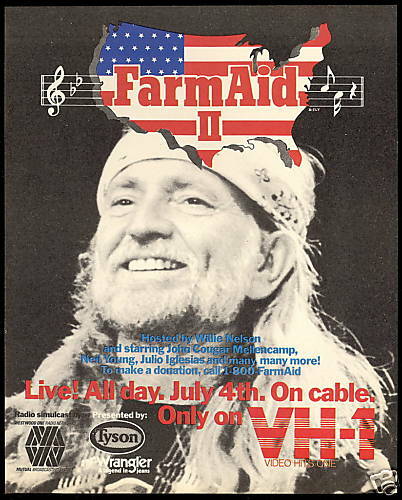 Additionally, this particular show coincided with the second Farm Aid, and so would be partially simulcast to that venue in Texas. Growing up outside of Toronto, I made plans to attend the show with my good friend Jake, who was a Grateful Dead fan. Back in the pre-Ticketmaster days, you could buy tickets for such shows at your local record store. Since all the tickets at the show were going to be rush seating, we planned to do just that – not bothering to line up, since it was impossible that the show would sell out. At lunch one day in high school we were discussing driving out to get the tickets, when we were overheard by someone with a locker close to us. He offered to get us the tickets because he “knew a guy”. We said sure, whatever, if he got them by the end of the day we’d gladly pay him instead. Now, our benefactor was not one of our friends. He was one of the school’s drug dealers, selling pot and hash behind the gym in an Iron Maiden t-shirt. You know the guy, I’m sure you had several in your school as well. In Etobicoke they all grew up to be city councillors. Anyway, by the end of the day we had our tickets ($25) and he had his money and all was well with the world. We began making plans to go to Buffalo. A few days later another friend of mine asked where I had gotten my tickets. He was friendly with the owner of the store where we had planned to buy them, and apparently, someone had stolen all the tickets from the store. We didn’t tell him where we got them, but we knew that this wasn’t going to be good. Not six hours later, a police officer was at my door. It just so happened that Jake was there as well. He interviewed us about the tickets, confirmed from the serial numbers that we were in possession of stolen property, he took the tickets and told us we might be called to testify in court. That was no good. Probably our worst decision in all of this was the one where we decided to try to get our money back from the person from whom we’d bought the tickets. Not only were Jake and I not an intimidating pair of toughs, but it directed attention our way. Not only did we not get the money, but the gang of guys who controlled the small-scale crime at our school decided that we were responsible for their friend getting caught. They eventually caught up with Jake at a party and beat him up until the police arrived to save him, and, almost a year, later the same happened to me. So, no Dylan tickets, out $25, caught a beating for it all, and we weren’t even the people who told the cops! Sometimes there is no justice in high school. After all this went down, by the way, and the police took our tickets from us, my parents said “What made you think you were going to be allowed to go to Buffalo anyway?” I told them our plan to drive down in my car and they told me their plan to never allow my car to go to a place like Rich Stadium. Poor Buffalo, they get no love. So it is likely that I wouldn’t have seen the show even if we did get tickets legally. Fortunately, today the internet exists. I have a partial bootleg of the show, and can listen to the Dead set on ListenToTheDead.com. I have no idea why the Dylan bootleg (Rich for Poor) omits the final third of the show other than the fact that many bootleggers are bad at their jobs. It seems like it wasn’t such a bad show – there are some lively songs, and Dylan and The Heartbreakers were definitely working better together than they were in Sydney for Hard to Handle. Three of the songs from the show are on YouTube because they were simulcast to FarmAid. You can imagine that I would have been there in the crowd shots at the end of each of the songs. But I wasn’t. My first Dylan-related tragedy. The version of “Seeing the Real You at Last” here is vastly superior to the one on Empire Burlesque. Bob Dylan’s relationship with The Grateful Dead has been a long, involved and convoluted one. The earliest intersection that I’ve come across this year was the 1969 Dylan interview by Jann Wenner in Rolling Stone where Dylan does little more than acknowledge that he’s aware of the San Francisco bands of the period, including the Dead. Of course, Jerry Garcia released an album of Dylan covers in 2005 with performances culled from as far back as 1973. And Garcia joined Dylan on stage in San Francisco in November 1980. 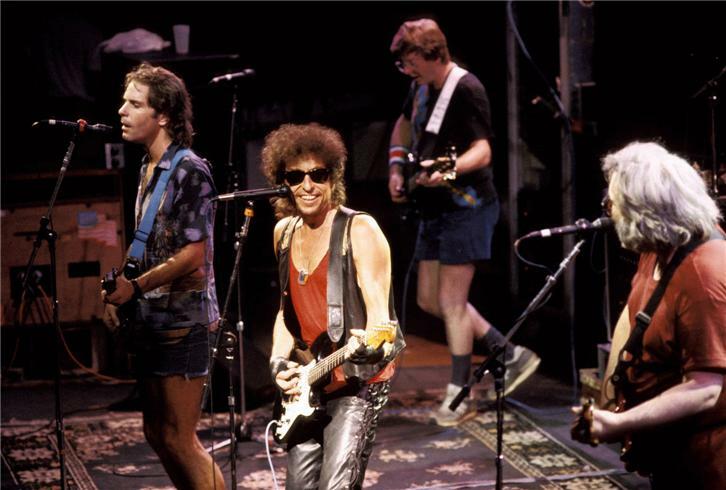 In the summer of 1986 Dylan and The Grateful Dead performed four shows together, with Dylan headlining three and the Dead headlining one. Those shows were in Akron, Oh (July 2), Buffalo, NY (July 4) and Washington, DC (July 6 & 7). The Buffalo show was the first Dylan concert that I ever bought a ticket to. More on that tomorrow. Click on the year, the show, and then the song to hear it. This archive, by the way, is just the most amazing thing I have ever seen. It makes me want to be a Grateful Dead fan. Oh, yes, I’m not a Grateful Dead fan. At all. I mean, I could name maybe three of their songs. Just could never get into them at all. Have had many Dead fans try to convert me. It has never worked, not even a little bit. I think I even went to a Dead show at Canada’s Wonderland (with someone else paying for my ticket) and I left to ride the roller coasters. I just do not care about them. So, I sat down to listen to these appearances. Both of them occur during the Dead sets, with Dylan joining them. Bjorner indicates that it was during the encores, but that doesn’t seem to be the case, at least as the concerts are presented on ListenToTheDead. Let’s start with Akron. 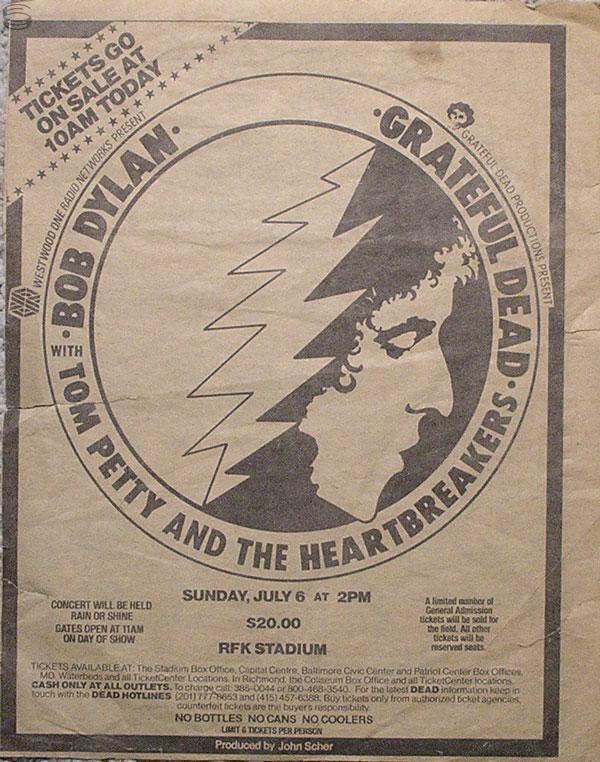 Dylan opened this show, so the Dead were playing after him. Bjorner has him playing guitar on “Little Red Rooster”. You can definitely hear a lot of cheering from the crowd about one minute in, and it seems unrelated to what the band is playing, so I assume that is when Dylan strode on. You’d have to be a much better blogger than I am to note the extent of his contribution, which seems to be guitar. This is followed by two Dylan songs. The first, “Don’t Think Twice, It’s Alright” is, I think, the best collaboration that will take place. I genuinely like this – Dylan belts out his lyrics and the Dead add a lot to the song musically. This is a really strong performance of a very good song. The duet that follows, “It’s All Over Now, Baby Blue”, is not nearly as good. Dueting with Dylan is a fool’s errand, as Joan Baez can probably tell you, and this just doesn’t work at all. The Dead have their way of working and Dylan has his, and they seem to clash here. Five days later, in Washington, they try it again. This version of “It’s All Over Now, Baby Blue” is much worse. Dylan seems to join midway through, and you first hear him sing at about the 4:00 minute mark. This is full of clanging guitars and sounds sort of out of tune. This is exactly what I don’t like about the Dead in a nutshell. “Desolation Row” isn’t that much better. They’re not in sync with the lyrics, they’re sort of randomly rotating parts, and it is just an unholy mess. Bjorner indicates that Dylan also played on the version of “Satisfaction” that ended the show, but you can’t make him out. He certainly could be there. That’s it. To my ear, one good song out of six. Everything else sounds like people stepping on each other’s toes. Dylan will tour with The Dead again in 1987, and that will result in a live album widely regarded to be both the worst Dylan album and the worst Dead album – quite the accomplishment. Not something to look forward after this little taste. Like all Dylan tours after 1974, the True Confessions tour of 1986 is well bootlegged, and you can probably get at least a halfway decent copy of every single show. 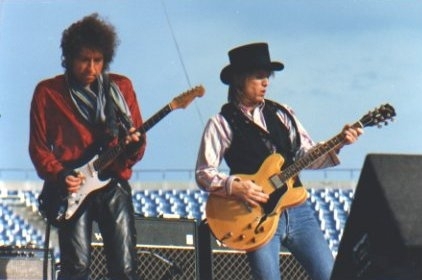 The first leg of that tour, which included shows in New Zealand, Australia and Japan, was the subject of an early HBO concert documentary, Hard to Handle. Filmed on February 24 and 25 in Sydney (the fifth and sixth of six shows in that city that month), the film seems to me to be fairly representative of the way that those shows sounded. Passive-aggressivly note on the liner notes “Tom Petty song” without even bothering to give a title, even if the song was a huge hit. Dylan fans can be, er, petty. Hard to Handle falls into the second category. You know that it’s The Heartbreakers up there, but you would never guess that they performed four songs on each of these evenings. It’s a Bob Dylan special, after all. It’s also short, at an hour. Dylan does ten songs, which is just under half of a typical set on this leg of this tour (he actually did 25 and 27 songs at these two shows, which is quite extensive by his standards – I’m sure that there was some talk about getting significant material to work with). About half the songs are taken from each of the shows, and, somewhat bizarrely, the spoken introduction to “In the Garden” is taken from the show on the 25th but the song itself comes from the previous evening. “In the Garden” is the most striking song on the bootlegs. While riding my bike yesterday I was listening to one of the earlier Sydney shows (very much like this one) and actually pulled over to make a note about Dylan’s spiel before this song, where he talked about heroes (Muhammed Ali, Bruce Springsteen, Michael Jackson (boy, would no one say that now…)), all of whom he disavows before singing a song about his hero, Jesus Christ. Many Dylan sources (i.e. Wikipedia) suggest that Dylan was post-Christian at this point in his career, but as this set piece makes clear, nothing could be further from the truth. Watching this video is a bit trying for me. In stark contrast to the Newport material from the mid-1960s or the Rolling Thunder video in Renaldo and Clara, there is not much to hold my visual interest here (this is inapt comparison, but we just watched the Katy Perry concert video with our eight year old and I realized how much the idea of a band on a stage performing songs is an antiquated idea now). The show is not that well shot – too much from the same side with the keyboardist – but I’m not sure how visually appealing you could likely make this anyway. I do think that it is a good representation of the tour as it was in Australia, which is not yet all the way there. The version of “Like a Rolling Stone” is incredibly limp, for example, and the band isn’t adding a great deal to the material. The versions here are less changed than they have been in the past (with The Band) or will be again in the future. It is a bit of a conservative sound. One big advantage of the tour is that they did a lot of material. While the shows often opened in similar ways, a lot of songs got done (Bjorner lists 48, with many of them, from “Mr. Tambourine Man” to “Heart of Mine”, sung only once on the tour). There are compilations of this material out there, and those seem better to me than any of the individual shows – but I certainly haven’t listened to all of the shows, far from it. Hard to Handle is available with some subtitles here until Dylan and/or HBO’s lawyers get a hold of it. You can probably also get every single song individually on YouTube and piece the whole thing together yourself. Enjoy!